I'm writing this week's Waiting for well ahead of schedule (on Monday morning, to be exact) because I'm getting the sinking feeling that I am going to have zero time to do much of anything besides drive around to meetings and (if all goes well) possibly return to full-time work. Which is great, but I'll get into that a bit more as the week progresses, since I really don't want to put the cart too far out in front of the horse. As it stands at the moment, I've already put the cart out about three feet too far. I have a habit of doing so, actually. I guess it's just my nature. You know all those cliched expressions that you always hear, like don't put all of your eggs into one basket, and...um...don't put the cart out in front of the horse? Well, I'm The Guy those expressions were intended for. Or, if you wanna get all technical-like, I'm The Guy for whom those expressions were intended. Ask Nathaniel; he'll tell ya. I have a driveway full of horse-less carts. But that's a story for another day. Oh, but before we move on...anyone in the market for some carts? No? Fine. I'll just sell 'em to Nathaniel, so his stable of palomino horses will finally have something to pull. Yes. Well. Did someone say something about comics? Since I'm writing this on Monday morning, there might very well be some changes in the shipping schedule, depending on how the week goes. I know from talking to a couple of different retailers that pretty much every store in my area was affected by last week's accident involving a Diamond shipping truck. It looks like any missing books will be trickling into most stores by the end of this week. But, today's (Wednesday's) shipment should not be affected at all, so you can expect to get all the books on your list when you head out to the store later today. Personally, that means...well...there will be very few books sitting on the shelves waiting for me. Which is fine, because the past several weeks have been killers. It's about time we had a nice, light week. I'm sure retailers aren't in love with the fact that there were problems last week, and today there's very little new product coming to them, but my wallet is quite happy. This being the case, I'll make things quick today. First up, we have a violent and over-the-top addition to an already violent and over-the-top cache of Punisher comics. Written by Jason Aaron and with art by the inimitable Steve Dillon, PunisherMAX (all one word), issue four, hits today, and promises to bring the pain. Sorry. My mind's wandering this morning. Anyway, here's my take on things. Punisher (or Frank Castle--his real name) is a tough character to write for a few reasons. First and foremost, he's basically a guy who goes around and shoots (and stabs and maims and tortures) people. Actually, he's not "basically" that. He is that. Pretty on-the-nose description of the guy, really. I mean, sure, the people he kills are all bad guys, but still. What makes a hero heroic is the way in which he or she goes about doing right. Good guys don't kill. They don't torture. They don't do any of the things that Punisher does--besides eat and sleep, I mean. And yet, here we have--and here we've had, for decades now--this character who inhabits the mainstream Marvel Universe and co-exists in the same (imaginary, but you get the idea) world as people like Captain America and Spider-Man. Sure, the "mainstream" Punisher is a bit less with the violent than his Marvel MAX counterpart but...waittaminute. No, he's not. The mainstream Marvel U Punisher is now a Frankenstein's monster who goes around killing things in horrible, horrible ways. Franken-Castle aside, though--and, yes, that's what they're calling him. And, yes, that series is quite good--the inherent problem with Punisher is that, at the heart of it all, he is not a likeable character. That's problem number one when attempting to write Frank Castle. Problem number two is that, anyone who jumps on the character today and in the near future does so in the shadow of Garth Ennis, who is, hands-down, the best writer to ever touch that book. What writer Jason Aaron does in PunisherMAX, though, is quite smart, and he takes a cue from Ennis. Aaron's first arc focuses on everyone around Castle, and Punisher shows up here and there to, well, to kill people. So, while it's Castle's book, he's featured much less than the surrounding cast. And that's great because, frankly, they are more interesting than Castle. 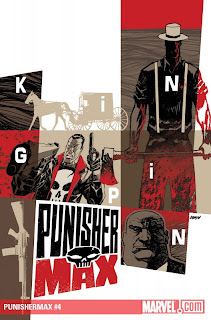 This arc, entitled, "Kingpin," focuses on the early days of Wilson Fisk, the Kingpin. This is as much of an origin story for that character as I have ever seen, and as a straight-up crime story, it works very well. “KINGPIN,” PART 4 While Wilson Fisk makes his move on the leading crime families of New York, Frank Castle has problems of his own. Namely the sledgehammer-swinging hitman known as The Mennonite. Explicit Content. Aaron is known for his grim and gritty crime and neo-noir work on books like Scalped and an excellent run on Wolverine: Weapon X, and his style fits the Punisher's world perfectly. And Steve Dillon is a master, and his work with Ennis on the Punisher has gone down in history as the best run on the character. Even though Dillon is on this new book, however, it doesn't feel like a Garth Ennis story at all. A lot of the writers that followed Ennis tried to imitate his style, and that's not always the best idea. Aaron brings his own voice to the character and to the crazy, violent world of Frank Castle, and it's got me back on the Punisher bandwagon. If you told me I'd be buying and reading two different Punisher titles at any one time, I would have said you're nuts. But here I am. Next up, we have a book that I know nothing about, other than what I've read in online solicitations. It sounds interesting, so I figured I'd mention it here, since we have a very literary readership. 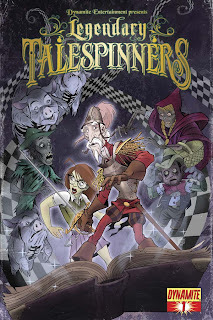 If you enjoy "Fables", "Stuff of Legend" and other great new stories, you will enjoy Tales of the Legendary Talespinners! From the dawn of creation there have been storytellers spinning timeless fables and folktales. Call them historians, poets, philosophers, or charlatans, it was their fanciful re-tellings of the age of wonder that kept children enwrapped in fantasy and immersed in imagination. But over the last two centuries something dark has been devouring the storytellers and even the stories themselves, leaving children with dulled imaginations and no will to believe in giant killers or wicked witches. Abby was one of those children and is now a young woman who still lives only in the concrete reality of her professional ambitions. Raised by a mother who had no time for "childish pursuits," she grew up too fast and locked her fertile imagination away forever. But Abby's orderly world comes crashing down upon her when a crazy old man who believes himself to be the real Baron Munchausen leads her into a festering fantasy world facing villainous henchmen, zombified fairytale creatures, and the most unlikely wickedest witch of them all. Dynamite Entertainment proudly presents an event that reshapes how we look at fables and the imagination! Written by James Kuhoric (Dead Irons/Freddy vs Jason vs Ash), illustrated by Grant Bond (Igor/Trick R Treat), and art directed by Nick Bradshaw (Danger Girl/Army of Darkness). Sounds pretty good, doesn't it? I'm hoping my shop has a few of these in stock, since I didn't pre-order them through Diamond. If not, I might just try to find it online, because it sounds like it's right up my alley. If I do manage to find it, I'll make a note to do a quick review on it for anyone who might be on the fence about picking up a new number one issue. It's a three-part story, so if the book stays on schedule, the collection should be out sometime this summer. Like I said, hopefully I can get my hands on a copy and see if it's as good as it sounds. With that, I need to skedaddle and head out to a meeting. Before I vanish, though--what are you Waiting for?